© Author(s) 2012. CC Attribution 3.0 License. Correspondence to: D. L. Griscom (david griscom@yahoo.com). Published by Copernicus Publications on behalf of the European Geosciences Union. The highly interesting article to be downloaded HERE once more sheds some light on the obviously everlasting discussion between defenders of persisting models of regional geology and supporters of new impact ideas. The interactive review comment by the author David L. Griscom is a nice reflection of this discussion: For the anonymous referee #1 the development of shock features in quartz and the occurrence of coesite are a necessary requisite for impact evidence which moreover should be integrated (!) by the author into the regional geologic processes at that time. Always the same old story. Impact is a statistical process that doesn’t consider regional geology (and regional geologists). And as for the missing shocked quartz and coesite we would like to point to the sedimentary component of the well-known large impact ejecta blanket of the Ries impact structure practically void of any shock effects. Tim has been known to us for a long time as a very experienced geologist and impact researcher. Unfortunately, his nice work has largely been ignored by the impact establishment, the so-called impact “community”. Meteorite Impact Structures – Geotourism in the Central Baltic. The posters may be clicked HERE. 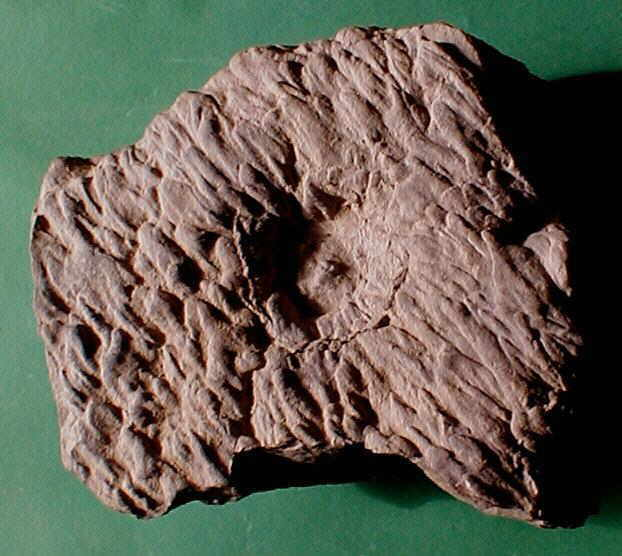 This sandstone sample has been found in a Buntsandstein outcrop near the town of Würzburg. A surface of well-developed ripple marks is disordered by a circular 5-cm diameter depression which is about 1.5 cm deep. A central mound is developed as well as a wreath of evidently excavated material at the rim of the structure. Such features may originate from a small pebble falling to a muddy ground. But in Buntsandstein times, who threw a pebble to the ripple-marked ground? Similar to well-known fossil raindrop remains in Buntsandstein sandstones and quartzites, the fall of a big hailstone may be considered, although its melting would rather produce a pit instead of a mound. On the other hand, rust-stains are observed to occur at the central mound. Therefore, the fall of a small iron meteorite (now weathered) to form the miniature crater may be a reasonable explanation. Geochemical analyses are outstanding so far.